The Senate's top Democrat is telling President Trump that any infrastructure deal must contain robust moves to bolster zero-carbon energy and build resilience to climate change. 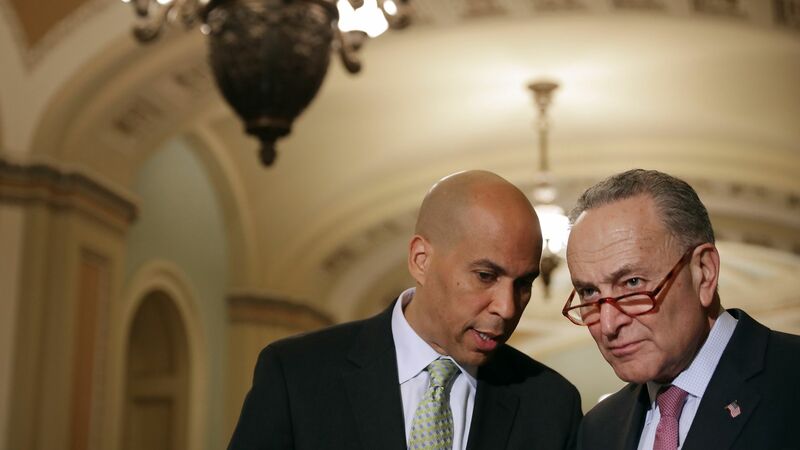 Why it matters: Senate Minority Leader Chuck Schumer' demand — spelled out in a new Washington Post op-ed — is the latest sign that climate is emerging as a priority for Capitol Hill Democrats, at least for now. Driving the news: Schumer writes that if Trump wants Democratic support on an infrastructure bill, it must have policies and money that "help transition our country to a clean-energy economy and mitigate the risks the United States already faces from climate change." Reality check: Infrastructure is perennially floated as an area where there's potential for bipartisan dealmaking. But actually getting a sweeping political deal done is a far tougher thing to imagine happening. That was true even before Schumer's decision to demand provisions aimed at addressing a problem that Trump scarcely acknowledges, and doesn't accept is human-caused despite the overwhelming scientific consensus. Schumer's op-ed also bashes Trump's moves to unwind Obama-era policies. Threat level: Schumer's op-ed says Democrats have leverage because they'll control the House and Trump will need 60 votes in the Senate — and therefore Democratic help there — to get an infrastructure bill through Congress. Permanent tax credits for clean power production, electric vehicles, energy storage, efficient buildings and more. Federal spending on new transmission to help move renewable power, as well as investments in smart grid and microgrid technology. "Substantially" increasing federal spending on research, development and deployment of clean energy. Money to help communities harden their infrastructure against extreme weather and disasters. A new federal loan program to help communities build resilience, including "natural infrastructure solutions" like restored wetlands.